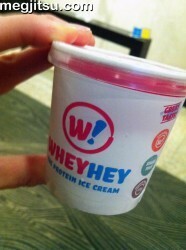 This week I discovered WheyHey, a low fat, sugar free ice cream packed with whey protein. Some of you may recall my 2010 obsession with baking my own ‘calibrated cookies’, aka home made whey protein flapjacks that were low in fat and sugar and perfectly suited to my post-workout protein and carb needs. There is significant amount of evidence for the efficacy of whey protein in promotion of lean muscle growth, aid in post-workout recovery and a range of health benefits. If you’re interested, WheyHey has compiled a comprehensive list of references on the subject. In my 30s I’ve found proper post-workout diet to be a lot more crucial to my regime; while I can train as hard as in my 20s, recovery is a lot slower and I need to build in more rest days than in those halcyon times. Whey protein really helps and I’m always on the look out for cool new incarnations as protein shakes are not to my taste. The texture of WheyHey is smooth and creamy and it can be consumed straight from the freezer without waiting for it to soften up. It is a delicious post-workout treat that really stops the hunger while delivering the benefits of whey protein and it definitely makes a nice change from protein bars and shakes. The texture of the ice cream is excellent and it is not too sweet and while the strawberry is pretty tasty, it definitely tastes of flavouring, a little like a subtle bubble gum flavour, rather than fresh strawberries. Would’ve been lovely to encounter a piece of real fruit here and there. 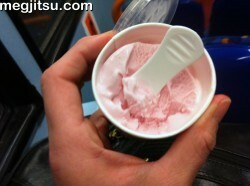 Equally, while I did enjoy my treat and it definitely staved off the pangs, it is a bit of a faff to mess about with the lid, tub and wee plastic spoon while heading home on the bus; sticky finger issues. However, a perfect treat for a civilised break in the park before heading home. Each tub is bursting with protein, but it is low on carbs so you may need to supplement your snack if you are interested in getting the 4:1 carb:protein ratio for optimal recovery. Currently WheyHey is sold through gym outlets and I got mine at Reebok in Canary Wharf where it retails for the rather handsome price of £3.50 per 150ml tub.